Welcome to Lobster Pool Restaurant! If there's one thing we love, it's seafood. From tilapia to crab claws and salmon, we simply love it all. But there's something that we like more than anything — lobster. There's just something so delicious and succulent about lobster that made us come back time and time again. You've landed on our site, Lobster Pool Restaurant, and are probably wondering, "what the heck did I just find?" Our site is dedicated to the love that we have for seafood. We mainly focus on lobster, but we also dive into other delicious dishes from around the world that we've had the pleasure of trying. We like to take an eclectic approach to the seafood that we eat, so that we can experience a variety of delicious dishes from around the world. Information about seafood, and seafood in general. We particularly like our "Secrets to Cracking and Eating Lobster" post — it's a must-read. Lobster Pool Restaurant is our way to keep track of all of the delicious recipes that we come across. And Jane really wanted to give blogging a try, so I decided to come along for the ride. We'll try to add in more information and recipes as soon as we possibly can. If you have any recommendations, we would love to hear them. We love trying new recipes and providing you with the best information possible for your seafood needs. As Jane is often the cook, William (me) is often the one with lobster meat and butter all over his shirt. While Jane hopes that I don't pass my disgusting eating habits onto our readers, she does hope that we will be able to reach out to other seafood lovers that have the same passion that we have. Shabu Shabu is a Japanese dish that's traditionally prepared with beef which has been thinly sliced. Because this dish is more on the savory side, lobster is easily substituted to create a delicious, flavorful meal that's surprisingly simple to prepare. Start by placing the 5 cups of water, dried seaweed and ginger in a pot. Bring to a boil and reduce heat. Continue simmering for 10 minutes, and remove from heat. Return to boil, and add the Enoki mushrooms, Shiitake mushrooms, tofu, sesame oil, soy sauce, green onions and cilantro. Serve the boiling broth with a platter of lobster. Have your guests cook their lobster by dipping it into the hot broth with forks or skewers. 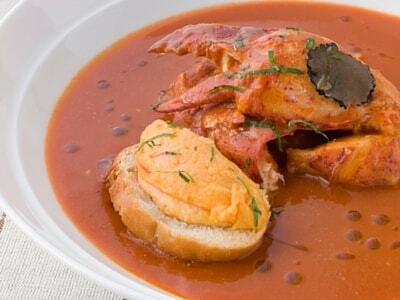 After all of your guests have cooked their lobster, serve the remainder of the broth in small soup bowls. The lobster can be eaten as-is, or served with ponzu sauce on the side. See the recipe below. Because the broth needs to be served while it's still boiling hot, a cast iron pot is recommended for cooking as it will hold onto heat for much longer than stainless steel. Incredibly easy to make, Ponzu sauce will add complexity and richness to the dish. Serve on the side as dipping sauce to complete the meal. Whisk ingredients together, and serve in dipping cups.